When the weather is fine, there is nothing quite like having a barbecue and eating al fresco, everything seems to taste better and cooking outdoors is a real pleasure. Unlike the UK however, Andalucia basks in over three thousand hours of sunshine a year which means that cooking on the barbecue, whether just for yourself or for family and friends, is almost an everyday occurrence. In fact during the summer months, many people rarely cook indoors and extensive outdoor summer kitchens are a feature of many gardens and patios. Even in December, we regularly eat outdoors at lunchtime, you need a jumper or two but the warm winter sun and clear bright blue skies are just so inviting. Barbecue cooking in Andalucia is very different to the typical Bank Holiday affair in the UK with Dads serving up burnt black sausages, which are a little too pink in the middle. There are no gas barbecues and we never, ever put things in the oven to keep warm! The design of barbecues you can see varies hugely, a few people buy theirs but most people prefer to have them built or they build their own and these are the most interesting. They range from simple functional ones built out of brick, rustic style ones like ours made out of stone, which we just made up as we went along. There are lovely smooth sculpted ones with high chimneys that seem to blend in to the surrounding area. Of course there are the more professional ones with different levelled grills and two compartments either back to back so wind direction doesn't matter, or side by side. Both of these 'double' style barbecues allow you to cook different things at once such as meat on one side and vegetables on the other, or you can transfer the hot coals from one side to the other as they become ready so that you always have a constant supply of the perfect 'brasa.' Whichever style you see they are always big enough to take a large paella pan which is very important. The key to a perfect barbecue is of course, the brasa or hot coals. 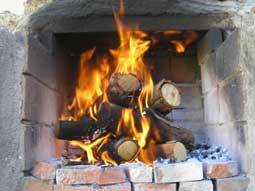 To get it just right the fuel of choice is wood, a mixture of pine and olive or almond. Charcoal is almost never used. The use of natural wood means you get lovely chunks of hot glowing red coals that give off just the right amount of heat. The added advantage to using olive or almond wood is that the food produced is slightly smoky in flavour with earthy hints and if you add some rosemary or thyme to the wood the smell and taste is naturally herby and delicate. It can sometimes take up to two hours to get the brasa just right but that gives you enough time to have an aperitif or a few tapas with friends while you wait. Sometimes barbecue cooking conjures up images of burgers and sausages which are black on the outside and raw in the middle but that needn't be the case at all. Here in Andalucia, the people have a passion for outdoor life, healthy eating and social occasions so the typical food of Andalucian barbecues is always fresh, exciting and varied. Almost anything can be cooked outdoors and in true Andalucian style family and friends get together to prepare a variety of dishes rich in colour and flavour to create a perfect atmosphere every time. This doesn't mean however, that you need to splash out on expensive ingredients, quite the contrary in fact. People here are experts at creating delicious dishes using fresh local produce at very little cost. Barbecued chicken is a favourite and it is much more economical to buy a whole chicken and get your butcher to joint it for you which is what the locals here usually do. A typical way to barbecue chicken here is once you have all the separate cuts, marinade the pieces in lemon juice, olive oil, garlic and thyme for a couple of hours. The marinade, as well as producing a lovely flavour, helps keep the meat moist during cooking and if you keep the cuts small it takes hardly any time which avoids burnt outsides and raw centres. 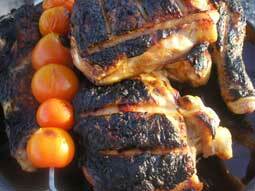 Other popular marinades for meat are honey and lemon or mustard and orange. However, nothing beats a pork or lamb chop or sausages and burgers simply cooked on the barbecue. Chops are generally cut really thin in Andalucia that means quick cooking and things don't get burnt. A favourite way to barbecue sausages is to roll them up and then skewer straight through with a sprig of rosemary or thyme for natural sausage skewers. Being close to the coast, fish is obviously a favourite barbecue dish and everything from quick seared sardines or prawns to fresh tuna steaks are cooked on the barbecue. Tuna stuffed with mint, wrapped in foil is a lovely treat but my favourites by far have to be gambas al pil-pil and the Spanish paella, either the seafood or rabbit and chicken varieties, which can all be cooked on the barbecue. 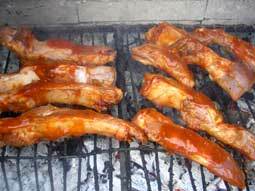 But the barbecue doesn't have to mean meat or fish with a side salad, many vegetable dishes can be prepared the same way as meat dishes. Baked potatoes are lovely cooked in the hot embers of your barbecue and if you put some olive oil, thyme and garlic in before cooking they are simply delicious. Vegetable kebabs are an obvious favourite too and if you have some good cazuelas you can do garlic mushrooms in olive oil, which are prepared in a similar way to gambas al pil-pil. A typical vegetable dish eaten especially in the summer is 'escalibada' which is tomatoes, red peppers and onions that are cooked on the barbecue grill until soft in the middle. It doesn't matter if the skins are a bit black as it all adds to the flavour and the skin is discarded anyway. Once cooked and peeled, chop them up, mix them together, add some salt and a drizzle of olive oil and that's it. The beauty of this dish is that it can be eaten hot or cold so you can prepare it in advance if you wish. During the summer, the best time to have your barbecue is in the evening - often it is just too hot at lunchtime anyway. The best thing about evening barbecues is the atmosphere. Garden lights or outdoor candles create a really warm, friendly feeling and after the meal what better way to relax than to put some more wood on the fire, sit back in the warm glow and watch the stars . . .